Training is mandatory for any new user who wants to access the facility*. The purpose of the training is to ensure that every user understands the principles behind flow cytometry, is aware of the best practices in the field, knows how the equipment and software work and feels comfortable to do some troubleshooting if necessary. For this reason, the training is given by the facility managers only (in-lab training won't be considered as training). ​Getting used to the instruments and software takes time and extensive usage. We highly recommend that you book a training when you are about to start your cytometry experiments. *Training can be waived if the new user can demonstrate that he/she has been previously trained in another facility. 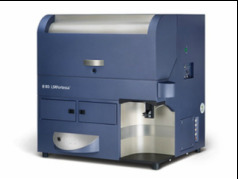 Cell sorting is a complex procedure that requires extensive understanding of flow cytometry and experience with the equipment. For this reason, cell sorting is only done by the facility manager. Sorting is performed under aseptic conditions using the clients' directives. Clients who do not need to run flow cytometry experiments frequently can ask to have their samples acquired by the facility manager. Once the samples are acquired, the manager will explain the results and can also perform the data analysis. With the multiplication of fluorochromes, reagents and equipment available, planning a good flow experiment can become challenging, but we are always happy to help you plan your futur experiments!